Florida-based Aqua Sciences, Inc. was formed to bring a product to market that literally extracts vast amounts of water from the atmosphere and outputs drinking water. Our patented water extraction technology was developed over 15 years and with more than $25 million invested in research, development and production. Aqua Sciences’ flagship product is the Emergency Water Station (EWS). The 40 foot model produces up to 2,600 gallons of water per day (depending on local atmospheric conditions). Specially designed for transport by air, sea or land in an International Standards Organization (ISO) marine container, the Aqua Sciences EWS is powered by self-contained electrical generators or external power. It is a compelling first and ongoing response solution for areas with damaged or no infrastructure throughout the world. • Excellent Water Quality: Meets and exceeds US EPA (Environmental Protection Agency), World Health Organization and US Military specifications. • Proven: Successfully deployed in the largest natural disaster in the history of the Western Hemisphere in early 2010 by a US Southern Command mission and saved lives at the University Hospital in Port Au Prince. Consistently made water and met customer needs during a 37-day desert test at a 100-person oil rig in the Middle East in the summer of 2010. Aqua Sciences has won highly competitive procurements issued by the US Army and FEMA. • Cost-effective: Highly competitive in cost and more economical than existing solutions in areas of need. • Fully “Off the Grid”: Does not require outside water or power to generate drinking water. Since the machine extracts only water molecules from the air, it eliminates the need for complex and high-maintenance filtration systems such as Reverse Osmosis Purification (ROWPU). It is ideal for areas with contaminated groundwater. 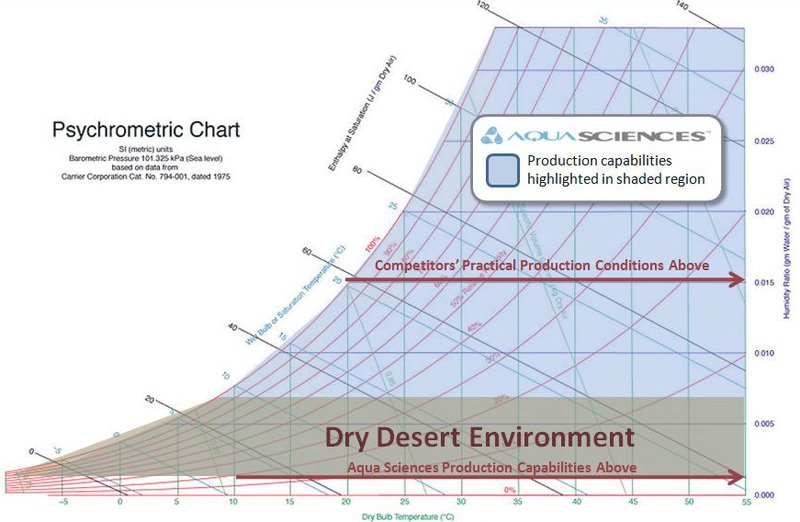 • Works in Virtually Any Environment, even in Desert Conditions: Aqua Sciences systems are NOT conventional refrigerant dehumidification (CRD) systems that condense water by cooling ambient air to the dew point and that are not suitable for low humidity conditions. 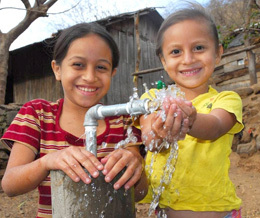 • Scalable: Aqua Sciences systems can be built for daily water needs of less than a hundred people to several thousand. 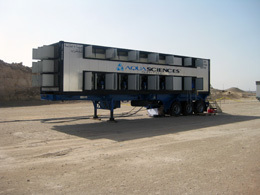 Aqua Sciences has developed a unique system capable of extracting water from the air.